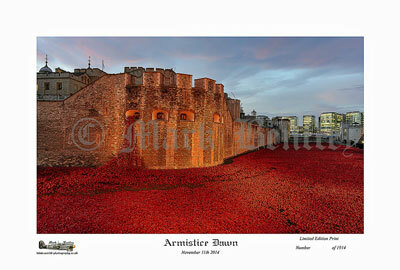 AN amateur photographer has created a limited-edition print of the famous poppy display at the Tower of London to raise money for Blesma, The Limbless Veterans and the Royal British Legion. Mark Bentley, a security officer from Stevenage with a passion for photography and military history, visited London on Remembrance Day last year and took the photo at dawn before joining the Remembrance Parade at the Cenotaph. The photograph – titled Armistice Dawn (right) – has been limited to 1,914 prints to mark the year the First World War began. All profits from the sales of the photograph will go to charity. Blesma, The Limbless Veterans is the national charity for all limbless Servicemen and women, their widows and dependants. It was formed in the years following the First World War and became a national charity in 1932.